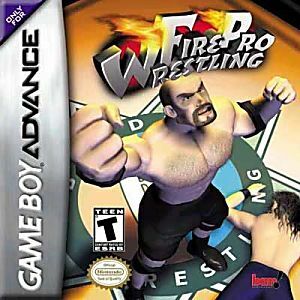 Fire Pro Wrestling GBA Game Boy Advance Game Cartridge Cleaned Tested and Guaranteed to Work! I ordered this game because I had heard some good things about it and loved the PS2 Fire Pro Wrestling Returns. After I ordered I went online to get more information and found out there is a HUGE following to these games. Combat is a bit advanced and different then what you'll be used to but once you play three matches you'll know what to do. Not only does it include wrestlers from Japan and China, it has wrestlers from ALL OVER THE WORLD even WWF/WCW. The only problem is because of copyright issues they can't give the WWF/WCW wrestlers the same name as the have on the show.....(So they added a name change feature for every already made wrestler) I suggest going to a forum and finding the characters real names but if you're a fan of WWF/WCW then you can probably guess who each character is based off of. Also, in create a character you can change just about anything but face and head have a preset list. How many would you think? 50? 120? Nope, over 420 different faces you can choose from including crazy ones like a ninja or bear! I went on to a few forums and found how to make Ryu and Ken from street fighter in the create a character, and they still had more to choose from. I rate this game as the 2nd best GBA game there is, only after Final Fantasy I&II Dawn of Souls. You like Gameboy? Then why haven't you ordered this yet?